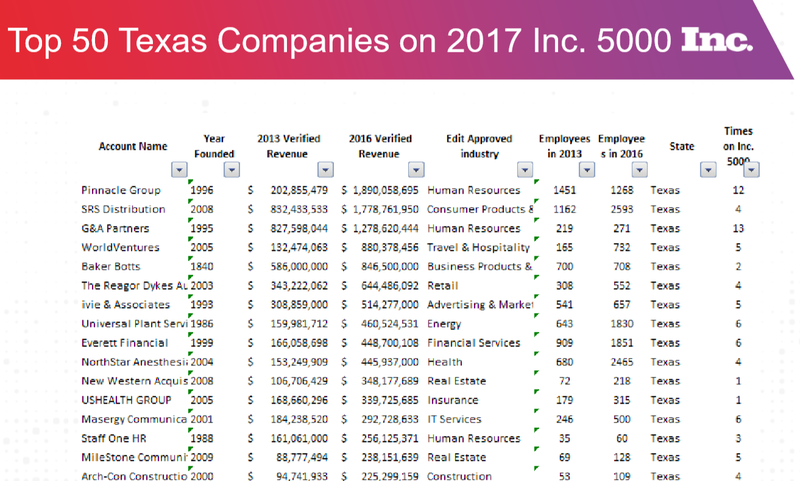 Who are the largest Texas businesses on the Inc. 5000 list? The Inc. 5000 list consists of the fastest-growing private businesses in America. Large businesses tend to have more difficulty maintaining the extremely high growth percentages required to continue qualifying. However, there are exceptions, including Pinnacle Group in Dallas with annual revenues of nearly $1.9 billion, and G&A Partners in Houston which has been on the Inc. 5000 list for 13 years — tied with two other non-Texas companies for the all-time national record. See the top Texas companies based on revenues below.